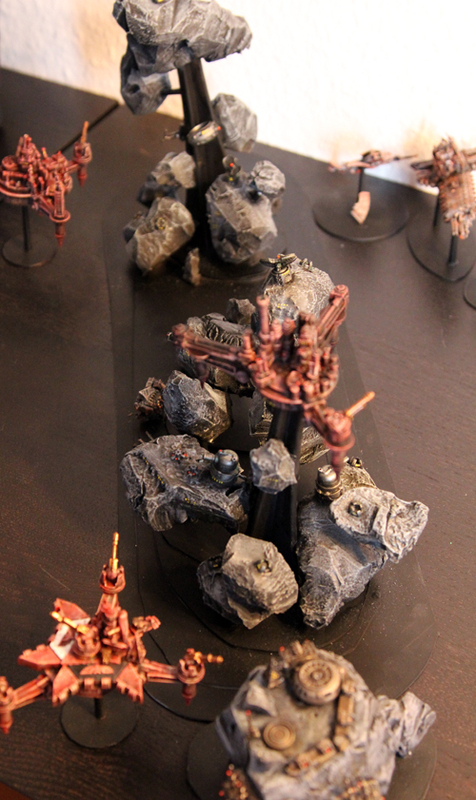 All pieces of terrain and scenery created for Battlefleet Gothic, Epic:Armageddon, Dropzone Commander and everything else at least a little bit related to scenery is going to be posted here. Most of the time I am using Polystyrene plates (foam or hard -compressed ones GW once used to call “Plastic Card”). Here in Germany I get most material from Modulor. Imperial city in ruins. Click for the article. This piece of scenery gave name to this blog. It was created for a very special BFG game. 10k fought against each other. A large gaming table, two planets called bauhaus and Thabun divided by warp anomalies and an asteroid belt That keeps Gemana, home sector of the Technocracy of Thabun and its cradle worlds secret and protected from the rest of the war torn galaxy. If you want to find out more about the background of Gemana, click here. The space stations were built out of gun platforms. 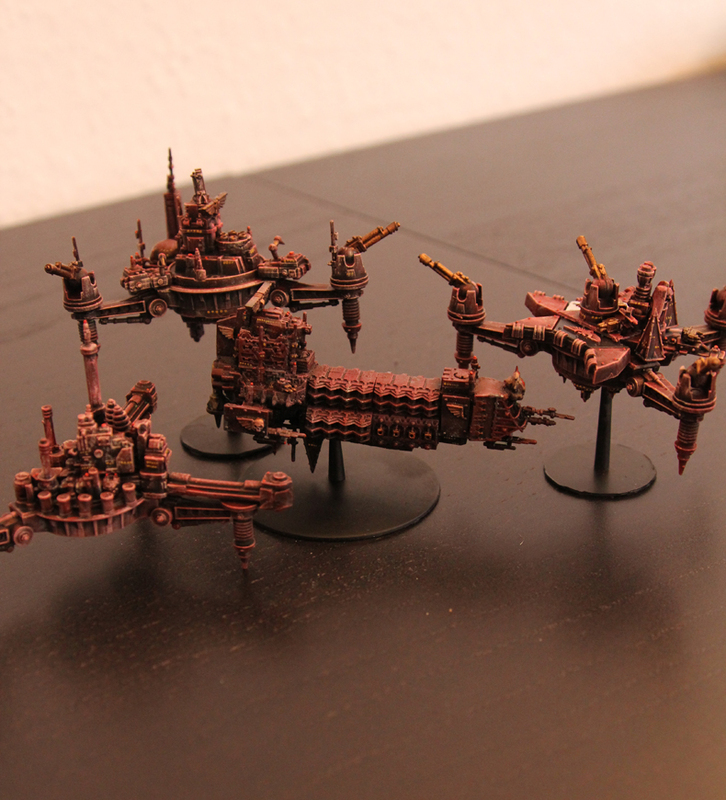 Those were part of “Planetary Invasion” from GW. 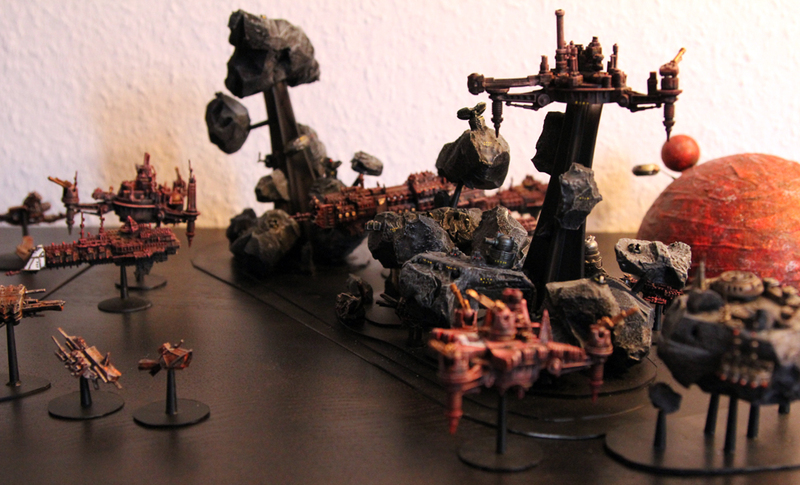 Adding different kind of 40K bits creates some really nice and relatively cheap scenery. A little trick: while exploring your bits box try not to see different guns etc. Try to see just an arrangement of cubes, columns etc. cutting some seals etc. away makes many bits very suitable buildings in BFG-scale. The home planet of technocracy was built out of two different sized Polystyrene balls. One cut in two halves is the planet itself, the smaller ball acts as moon now. Both were connected through chopsticks. Additionally there are two Space Stations in lower orbit, providing ground transportation for visitors, as the high command denies any landings on the planets surface with non-registered transports due to safety matters.